An indoor bike trainer is a device that attaches onto your rear axle and presses a resistance roller against the rear tire so that you can ride in place. Indoor Bike trainers come in a variety of types based on the resistance that is being provided. The four most common types of resistance are wind, fluid, magnetic or centrifugal. Wind- is one of the original trainer types. The resistance is created when the fan spins against the air. The fan is powered by the cyclist’s pedaling. The faster you pedal the more resistance as the rear wheel spins more quickly. Using a bigger gear can also create more resistance. Pros- they are very simple, durable and inexpensive. Cons- very noisy and limited amount of resistance. Click here for a review on the CycleOps Wind Indoor Trainer. Magnetic- instead of a fan the “mag” or magnetic trainer uses a magnetic flywheel to produce resistance. Pros- quieter than wind trainers, affordable, adjustable resistance, and have a wide variety of options. Some of the most fully featured models are the newer electromagnetic versions. Cons- the fixed resistance is not ideal and they are not as durable. Fluid- is the most common type of trainer. Fluid trainers are a type of magnetic trainer. They use a magnetic flywheel and chambers of fluid to create more resistance options. Pros-Fluid trainers are the best “feel of the road”, are quite, and wide range of resistance. Cons- fluid trainers are constantly improving but can overheat and leak fluid. Centrifugal- pressure plates provide resistance to the rear tire. Pros- the resistance can be adjusted and it is quiet. Cons- they are prone to break under extreme use. Rollers- the oldest indoor bike trainers. Your bike sits freely on three cylinders inside a frame. The precision drums turn as you pedal. The rollers provide resistance. Smaller drums (diameter) provide more resistance. There are also add-on elements for magnetic, fluid or wind. Pros- great for improving your form and elite athletes swear by them. Cons-You can easily fall off. It takes practice to get used to it and the resistance range is not great. 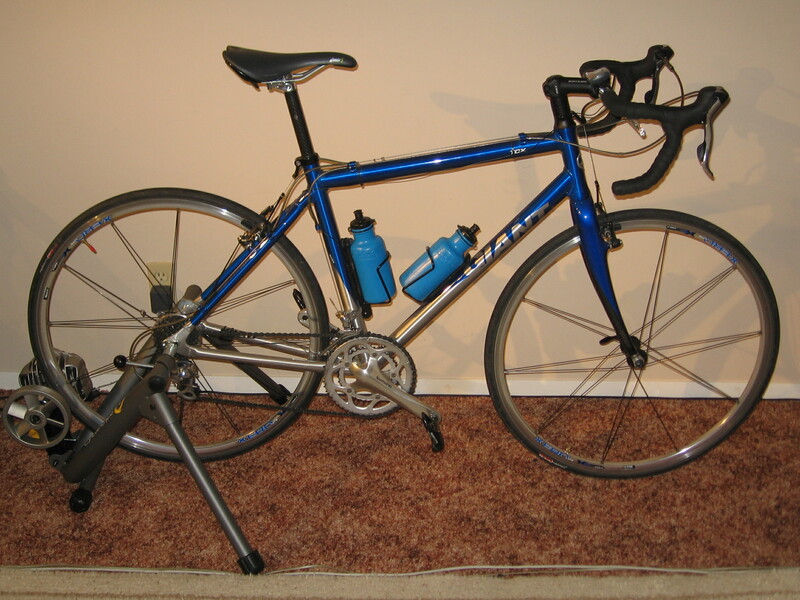 The main benefit of an indoor bike trainer is it allows you to ride you own bike indoors. The indooe bike trainer is a piece of equipment that attaches to the rear wheel of your bike. It allows you to ride stationary just like you would on the road. You can change the gears the same way to increase and decrease resistance. The trainer allows you to ride in all weather conditions and any fitness you gain is transferred when you ride again outside. Another advantage is to control your training without stopping in traffic, slowing down for obstacles and tackling hills. One major downside of an indoor bike trainer is they can damage your road bike. Clamping the wheels in place improperly can break your quick release system or chip the frame. Make sure you do this carefully as to not cause damage. Also, the rear wheel tire will wear down very quickly. It is recommended to use cheaper tires or a training tire when training at home instead of your road tires. Indoor bike trainers are going to make some noise. While some are noisier that others, the most effective method to dampen the noise is to use a trainer mat. A trainer mat dampens as many vibrations as possible and absorbs a lot of the noise. Trainer mats are also designed to reduce the likely hood of your trainer tipping or falling off balance. The benefit of riding outside is that your traveling increases the wind speed against your body. The wind keeps you cooler. Even when you are sweating, the airflow evaporates the sweat. You will notice while using the trainer you will sweat much more, to the point of dripping on the floor. Which Indoor Bike Trainer is best for me? For a beginner cyclist it is best to use a stationary trainer. If you are a regular cyclist, rollers imitate outdoor riding the best. Do you want a roller (can easily fall off without practice) or stationary trainer (more stable because your bike is attached)? How much money do you want to spend? Wind is the least expensive and Fluid is the most expensive. Do you need varying resistance? Wind does not give varying resistance but Fluid and Magnetic do. How often will you use it? Durability is very important. Make sure you read reviews to make sure your investment will hold up. Does it need to be quiet? Wind based trainers are very noisy. Reviews will help you determine the amount of sound produced. Is it easy to get your bike on and off? Make sure the functionality is to your standards. Is it smooth and sturdy? 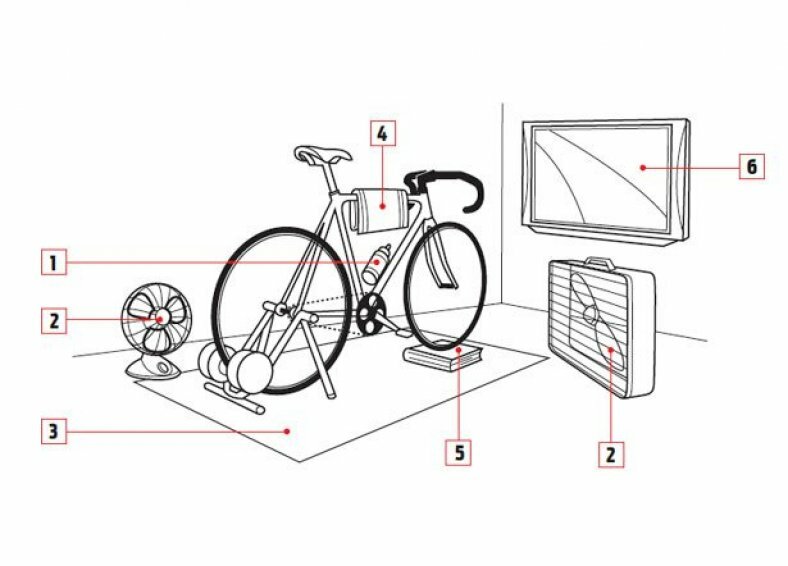 Once you pick the right indoor bike trainer, you will also need some accessories to make your ride comfortable indoors. Water- lots of water to drink. You will need to drink more water than you do outside due to the excessive sweating. Fans- you will more than one fan to circulate air and keep your back tire cool. Rubber Training Mat- You will sweat a lot to the point of dripping. The mat will help keep your trainer in place. Towel, Bike Thong or Sweat Catcher- you can use a towel or a bike thong that goes over your frame to protect it from moisture. A thong may also come with an accessory pouch to keep your TV remote and other things handy. Bike riser or block- this levels out the wheels and keeps the front steady. A phone book can work if you can find one. Entertainment- TV, iPod, Phone, anything to keep your mind busy.